I'm finally sharing a few pictures of my Twirling Trellis quilt, featured in the current issue of Modern Quilts Unlimited. This is one of my favorite quilts ever. It was so fun to design, piece and quilt. I think the thing that I enjoy most about this quilt is that I didn't expand the pinwheel's into the outside white sections. It just adds another layer of interest. Like so many of my quilts, this one is foundation pieced. This one is the perfect size for a wall hanging or a table topper. This was the first quilt that I tried ruler work on my longarm. I stitched in the ditch around the yellow and pink, and did some ruler work in the lime green. This quilt was made entirely of Michael Miller Cotton Couture solids. I find that the Michael Miller solids have such a nice, soft hand feel. They're one of my favorite solids to work with. Like most people that I talked to, I struggled to find inspiration for this challenge. The fabrics were difficult for me, but I dug deep into my sketches of quilt ideas and pulled out a quilt design that I thought would work well. I have to say, I'm pleased with the results. Sometimes it takes a challenge to get you to push your boundaries. I'm calling this quilt, "Shootin' the Breeze" because the pinwheels look like they're spinning in the wind. I designed this paper pieced pattern a while ago and pulled it out for this challenge. I struggled with how to quilt it. Originally I wanted to quilt each pinwheel individually, either with custom quilting or with a spiral around each to emphasize the movement. My swirls aren't the greatest, so after I unpicked my first attempt, I went back and did some wavy lines to make it look like the wind was blowing. 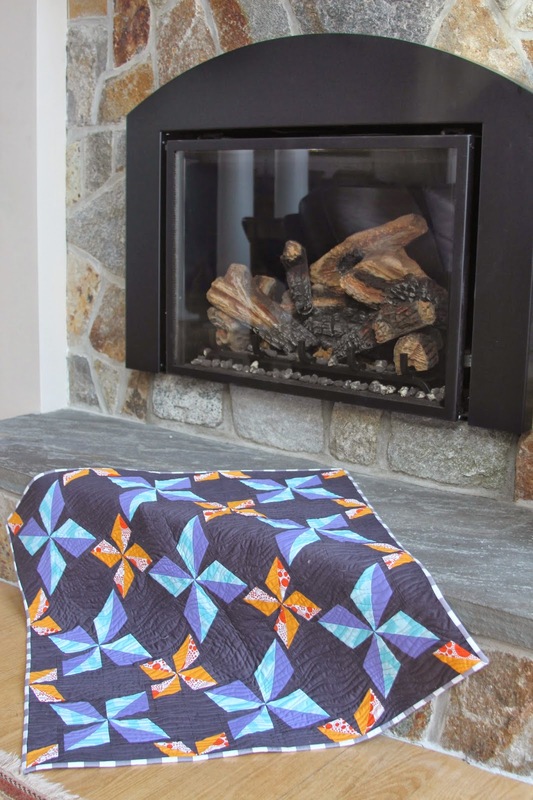 This quilt finishes at 35" square and will make a nice wall hanging or table topper. I used So Fine! thread for the quilting and Quilter's Dream Cotton for the batting.